Transit signal progressions, a form of pre-timed or “passive” transit signal priority, are signal progressions (green waves) set to realistic travel speeds for on-street transit, often in the 12–20 mph range. Signal progression speeds determine the pace of an urban street. However, signal progressions are frequently set without regard for stop-related delay, including dwell time and time lost to acceleration and deceleration at each stop. Progressions set at or near the speed limit can cause transit vehicles to fall behind the signal progression after making a stop, and long signal cycles impose additional delay on transit. Using a short signal cycle with offsets that account for dwell time, especially at high-volume stops, allow buses and streetcars to remain within the ‘green wave’ of a signal progression. Short signal cycles combine well with low-speed progressions by further reducing the penalty for falling behind the signal progression. On one-way and high-frequency corridors, signal progressions timed at 12–15 mph can significantly improve average transit speed. Signal cycles integrate expected dwell times. On signalized streets with a high volume of transit vehicles, typically more than 10 per hour or with combined headways less than 4 to 6 minutes, in mixed-traffic or dedicated lanes. Where active transit signal priority is less feasible or has limited benefits, including streets with short distances between signals, streets with high pedestrian activity levels, and streets with short signal cycles. Transit signal progressions are highly effective on one-way streets. On two-way streets, it may be necessary to prioritize the peak direction transit service if progressions are not possible in both directions. Reducing signal progression speeds to meet average transit running times allows buses and streetcars to keep up with the signal progression. Especially on streets with transit lanes, or where most traffic clears within the vehicle platoon, transit vehicles can catch up to the signal progression after a stop. The combination of a low-speed signal progression and short signal cycles can improve transit performance. Timing signal progressions to lower speeds provides additional efficiency benefits to bicyclists, and promotes a safer urban street environment for all users by discouraging high speeds. The combination of reduced variation and reduced average travel time by using transit signal progressions can result, over the course of a long, frequent transit route, in enough time savings to result in an additional run with the same number of vehicles. To maximize the effect of passive signal priority, transit travel time variability should be reduced through stop consolidation and dedicated transit lanes. Signal progression speeds should be considered in the overall context of the street. Block length, crossing distance, and traffic volume are relevant to the selection of transit-friendly signal progression speeds. In Portland’s application of a 13 mph progression on its dense downtown grid generated a “reverse progression” for pedestrians traveling 4 mph. Peter Koonce. Transforming Traffic Signals to Support Sustainability: Applications, Ideas, & Research. Transportation Research and Education Center, Portland State University (2011). Private motor vehicle travel times may be increased when signal progression speeds are reduced, but since signal delay is a large portion of car travel time, short signal cycles may offset this increase for most trips. On downtown streets with intersecting progressions or on transit corridor streets with high transit volumes, active transit signal priority can be impractical. Instead, signal timing can build typical dwell time at stops into the signal progression, or the progression can be set to a lower speed. Include cross-street progressions in signal timing planning, especially for streets with high transit or total volume. On streets with a mix of transit services, extra attention will be needed to set offsets to minimize delays. In some cases, signal timing changes will require prioritizing a rapid service over a local area. Set signals to a realistic transit travel speed between stops, including deceleration, dwell, and acceleration time, as well as right-turn delay if applicable. While specific speeds vary, blocks without a stop can often be set to 20–25 mph, while the block before a stop will be set to 12–15 mph due to deceleration, and the signal after the stop should account for both the full door-open-to-door-closed dwell time, and the low average speed achieved during acceleration. Streets with transit in a dedicated lane may benefit from speeds of 15–20 mph if the bus can catch up to the progression after a stop. A transit signal progression should allow a very high percentage of transit vehicles to arrive on the green signal phase at each signal along the street. For the target routes (not necessarily all routes on the street), first evaluate the arrival pattern of transit vehicles to each signal downstream of a stop. Set a target percentage of arriving vehicles, and adjust the signal offset such that a large percentage (such as 80% to 90%) arrive at the signal at least five seconds after the start of the green phase and ten seconds before the end of the green phase. Then adjust downstream signals accordingly, accounting for the new offset. The resulting progression should be somewhat faster than the existing transit travel time, since signal delay will be substantially reduced for the slowest runs. Reflect this new travel time in updated schedules. 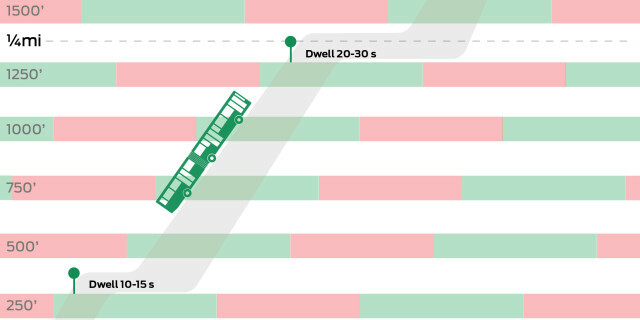 In mixed traffic or in destination sections with frequent stops, transit operations typically benefit from signal progression speeds of 12–15 mph, which can coincide with comfortable signal pacing for active transportation modes. Christopher Pangilinan and Kristen Carnarius. Traffic Signal Timing for Optimal Transit Progression in Downtown San Francisco. 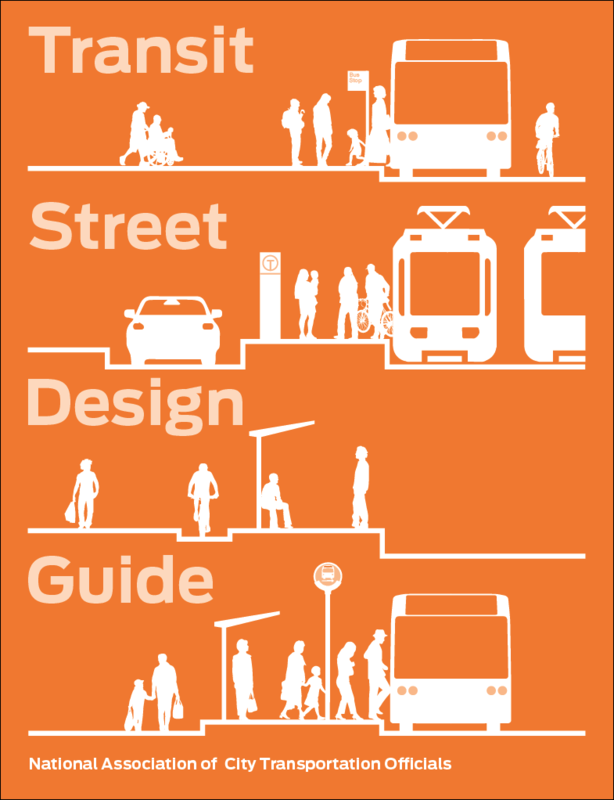 SFMTA, Presented to the Institute of Transportation Engineers (2014). Alternating near-side and far-side stops makes the best use of transit-friendly progressions, placing the bus at the front of the traffic platoon after a near-side stop, and the back of the platoon after a far-side stop. Signal progression speeds must be set lower than the speed limit, preventing transit operators and motorists from being incentivized to speed to catch the progression if they fall slightly behind. Transit-only streets with high pedestrian volumes may require lower speeds. Where bikes and buses share a lane, prevailing bike speeds should be used to set transit progression speeds to prevent leapfrogging. Bike speeds are typically 12 mph for flat terrain, lower for uphill and higher for downhill sections, up to 20 mph. Where peak-period traffic is much higher than midday or evening traffic, peak progression speeds should be very low, consistent with peak traffic and potentially with longer signal cycles. Slightly higher speeds, up to 20 mph on some streets, with shorter cycles, may be used at off-peak times.